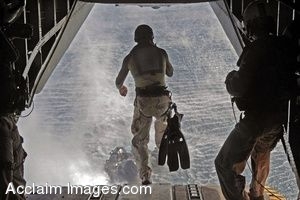 Description: Clip art photograph of a U.S. Air Force pararescueman from the 82nd Expeditionary Rescue Squadron (ERQS) jumps out of a Marine Heavy Helicopter Squadron (HMH) 461 CH-53E helicopter during freefall swimmer deployment training in the Gulf of Aden. GULF OF ADEN, Djibouti. Once in the water, deploying team members surfaced with raised clenched fists overhead and immediately located other team members. (U.S. Air Force photo by Staff Sgt. Joseph L. Swafford Jr.) Clipart photograph by Department of Defense Public Domain.